Despite riding the crest of an unprecedented wave of popularity, Theodore Roosevelt declined to run again for the presidency in 1908. He anointed William Howard Taft, his close friend and Secretary of War as his successor. Taft easily won the election defeating William Jennings Bryan in his third and final attempt to gain the Oval Office. Immediately following Taft's inauguration in 1909, T.R. set out for Africa to hunt big game and collect specimens for the Smithsonian Institution. His decision was based on his desire to leave the political stage to his successor and on his natural need for action. In April 1909, he landed in Mambasa with his son Kermit. Roosevelt, at the head of a safari including 250 porters and guides, trekked across British East Africa, into the Belgian Congo and back to the Nile ending in Khartoum. The ex-president thoroughly enjoyed himself. The expedition collected 1,100 specimens, including 500 big game. "The most noteworthy collection of big animals that has ever come out of Africa" he exclaimed. Unfortunately for the animals, "collected" in those days was an euphemism for shot and killed. Between the two of them, Theodore and Kermit slew 512 beasts including 17 lion, 11 elephant and 20 rhinoceros. The remaining animals were no doubt happy to see T.R. leave the plain. After the year-long hunt, Roosevelt proceeded to England for the funeral of King Edward VII and then on to Norway to accept the Nobel Peace Prize for his part in ending the Russo-Japanese War. He returned to the U.S. in June, 1910. As Roosevelt stands over a freshly shot eland, a native guide approaches with the news of a rhinoceros sighted near by. 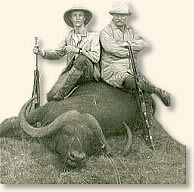 Roosevelt follows the guide accompanied by Captain Arthur Slatter, an Englishman who runs an ostrich farm and an excellent hunter despite earlier losing his right hand. "Slatter and I immediately rode in the direction given, following our wild-looking guide; the other gun-bearer trotting after us. In five minutes we had reached the opposite hillcrest, where the watcher stood, and he at once pointed out the rhino. The huge beast was standing in entirely open country, although there were a few scattered trees of no great size at some little distance from him. We left our horses in a dip of the ground and began the approach; I cannot say that we stalked him, for the approach was too easy. The wind blew from him to us, and a rhino's eyesight is dull. Thirty yards from where he stood was a bush four or five feet high, and through the leaves, it shielded us from the vision of his small, piglike eyes as we advanced toward it, stooping and in single file, I leading. The big beast stood like an uncouth statue, his hide black in the sunlight; he seemed what he was, a monster surviving over from the world's past, from the days when the beasts of the prime ran riot in their strength, before man grew so cunning of brain and hand as to master them. So little did he dream of our presence that when we were a hundred yards off he actually lay down. "Walking lightly, and with every sense keyed up, we at last reached the bush, and I pushed forward the safety of the double-barreled Holland rifle which I was now to use for the first time on big game. As I stepped to one side of the bush so as to get a clear aim, with Slatter following, the rhino saw me and jumped to his feet with the agility of a polo pony. As he rose I put in the right barrel, the bullet going through both lungs. At the same moment he wheeled, the blood spouting from his nostrils, and galloped full on. "Before he could get quite all the way round in his headlong rush to reach us, I struck him with my left-hand barrel, the bullet entering between the neck and shoulder and piercing his heart. At the same instant Captain Slatter fired, his bullet entering the neck vertebrae. Ploughing up the ground with horn and feet, the great bull rhino, still head toward us, dropped just thirteen paces from where we stood. "This was a wicked charge, for the rhino meant mischief and came on with the utmost determination." "One by one the spearmen came up, at a run, and gradually began to form a ring around the lion. Each, when he came near enough, crouched behind his shield, his spear in his right hand, his fierce, eager face peering over the shield rim. As man followed man, the lion rose to his feet. His mane bristled, his tail lashed, he held his head low, the upper lip now drooping over the jaws, now drawn up so as to show the gleam of the long fangs. He faced first one way and then another, and never ceased to utter his murderous grunting roars. It was a wild sight; the ring of spearmen, intent, silent, bent on blood, and in the centre the great man-killing beast, his thunderous wrath growing ever more dangerous. "At last the tense ring was complete, and the spearmen rose and closed in. The lion looked quickly from side to side, saw where the line was thinnest, and charged at his topmost speed. The crowded moment began. With shields held steady, and quivering spears poised, the men in front braced themselves for the rush and the shock; and from either hand the warriors sprang forward to take their foe in flank. Bounding ahead of his fellows, the leader reached throwing distance; the long spear flickered and plunged; as the lion felt the wound he half turned, and then flung himself on the man in front. The warrior threw his spear; it drove deep into the life, for entering at one shoulder it came out the opposite flank, near the thigh, a yard of steel through the great body. "Rearing, the lion struck the man, bearing down the shield, his back arched; and for a moment he slaked his fury with fang and talon. But on the instant I saw another spear driven clear through his body from side to side; and as the lion turned again the bright spear blades darting toward him were flashes of white flame. The end had come. He seized another man, who stabbed him and wrenched loose. As he fell he gripped a spear head in his jaws with such tremendous force that he bent it double. Then the warriors were round and over him, stabbing and shouting, wild with furious exultation. "From the moment when he charged until his death I doubt whether ten seconds had elapsed, perhaps less; but what a ten seconds!" Theodore Roosevelt's account appears in: Roosevelt, Theodore, African Game Trails (1910); Morris, Edmund, The Rise of Theodore Roosevelt (1979). "On Safari With Theodore Roosevelt, 1909," EyeWitness to History www.eyewitnesstohistory.com (1997). During WWI, Kermit Roosevelt fought with the British army in Mesopotamia. He again served in WWII fighting with the US army. He died by his own hand during the Alaskan campaign on the Aleutian Islands. Two of the Nandi hunters were wounded during the encounter with the lion. TR awarded each a heifer.